Jaanika Peerna is an Estonian-born artist living and working near New York since 1998. Her work encompasses drawings, videos, installations and performance, often dealing with the theme of transitions in light, air, water and other natural phenomena. She is often involved in collaborative projects working with designers, dancers and musicians. She has exhibited her work extensively in the entire New York metropolitan area as well as in Berlin, Paris, Tallinn, Helsinki, Lisbon, Rimini, Dubai, Honolulu, Novosibirsk and Rome. Her work is in numerous private collections in the US and Europe and was recently acquired by Fonds National d’Art Contemporain, Paris. Her work is represented in the United States by Masters Projects in New York and ARC Fine Art in Connecticut. I am sitting on a folding white, plastic chair with a metal frame, feet up on a bent plywood stool covered with little splatters of white paint. The evaporating steam from my dirt-black tea is almost invisible, as the air coming in from the window of my Brooklyn studio is hot and heavy this morning. After an unusually cool August, the familiar, steamy NY summer weather is here, giving me more excuses to extend the summer despite my fast-growing list of exhibition openings, panel discussions, deadlines for statements, and promises to myself. Can I have ONE MORE DAY of a totally free-floating agenda, please!? No plan. Zero effectiveness. One more slowly-sipped tea while I watch the light changing color, and let the sounds of loading trucks down the street blend into a vast symphony with no end and no beginning. Can I? But CAN New York, as it is today, ever be in sync with the laid-back tempo of Berlin, for example? Having just spent a year working in Berlin, one can clearly see how different a vibe there is between those two great cities. One offers endless time to converse in various languages about the minute details of the reflected light coming off of the thick layer of graphite on a mylar drawing. The other one urges you to make a plan on how to sell the artwork. One offers a generous four hours for a live drawing performance in a building made from old windows; the other makes you worried if people will have the time to spare in case your performance happens to go on longer than 15 minutes. One never promises to make you rich. The other one keeps the promise alive, no matter what. Both feed your ideas with their multi-culti mix of people surrounding you daily, offering a place for solitude if you need it, and welcoming you in as you are. But it is definitely easier to become a New Yorker than a Berliner. Though I have to say that I was lucky: I DID become a Berliner after having spent a year there, for the day before I left Berlin, my bike, called “Silence Deore”, was stolen. They say this is a sure sign that you have made it into the ranks of Berliners – when your bike has been taken from you. To become an Estonian is pretty much impossible, unless it was given to you by birth. So, I was lucky once again. And even though I have not lived in Estonia for more than 16 years now, I feel this especially tender line connecting me to that piece of land and its sea shores. 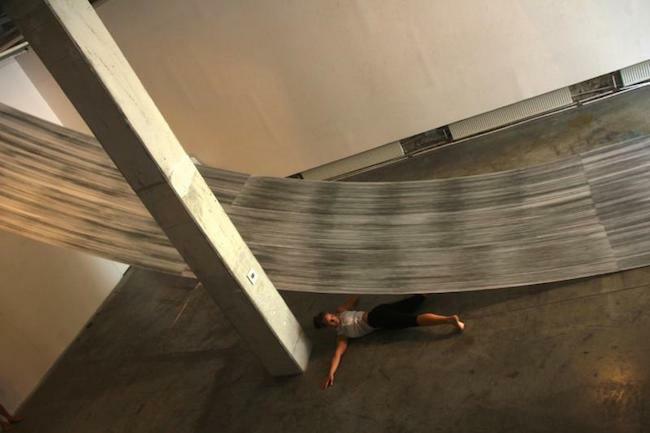 And this summer, I got to install the longest line drawing I have ever made, at gallery Vaal, in Tallinn. It felt like, had I taken all of the lines from all of the drawings included at the exhibition, and tied them together into one line, it would have been long enough to reach from my first-ever studio in the heart of medieval Tallinn, to my studio right here in Brooklyn. And the connection would be made. Simply and surely. It WOULD BE. I got to slide my hand across the extra-smooth plaster, that had been turned into a sculpture, during my studio visit. I was happy. He was, too. And I am sure he had forgotten the hardships of New York-style plaster transportation – at least when compared to the ease of transporting plaster door to door, by car, in LA. And here I am in Brooklyn, the part of New York that is supposedly THE place for art and culture these days. Although many of the people who moved here during the last 15 years or so, and who made the place what it is (in terms of an accumulation of the arts) have been forced to move out of certain areas by rising real estate prices, there still are many other areas to explore. Brooklyn is vast. And growing. From the shores of the Atlantic, to Bushwick, and to the shores of the Hudson River – and everything within. 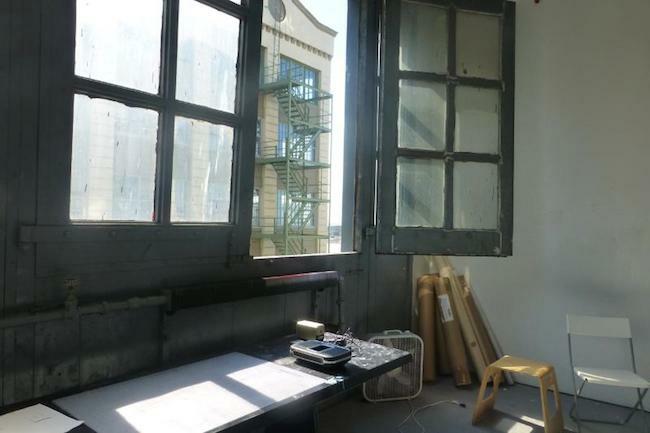 Artists take up studio spaces in new industrial areas, and then move on when they cannot afford to rent their studios anymore. Red Hook has been home to many artist studios for a while. Kentler International Drawing Space was a real pioneer there when they opened as a tiny establishment 25 years ago. And they are still there, and have a lovely line–up of exhibitions opening this year. In fact, I am taking my bike and heading there right after my studio day. 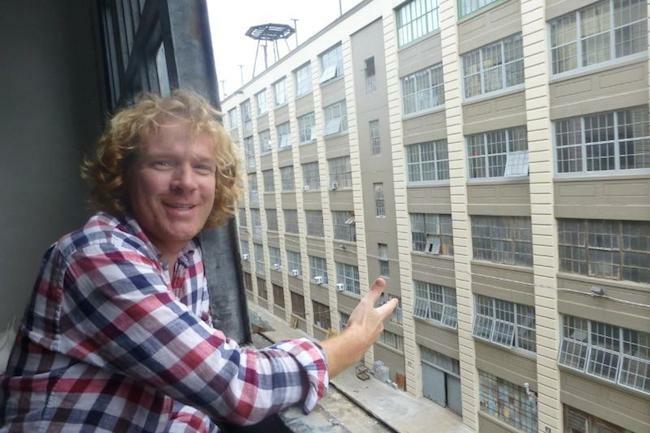 And the Sunset Park area of Brooklyn has a couple of artist residencies and a bunch of studios in Industry City buildings. One of those studios happens to be where I am sitting right now, itching for some studio time. And my tea has run out… the need for a big glass of water increases as the heat coming in from the open window fills every single corner of the space. So here I am, making the first long line on the sensual surface of mylar, and only then will I celebrate the beginning of the new season of the New York art world out there!